We stayed at Long Island Resort who seemed to be glad that we were there, especially the Entertainments guy. Later that night we realised that he expected everyone to sing karaoke! After a while though people seemed to warm to the idea and we ended up doing 4 songs between us! 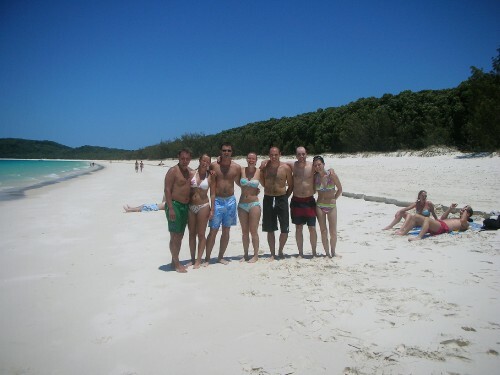 We went on a sailing trip around the Whitsundays, on "Camira". 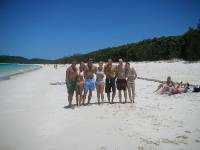 The highlight was Whitehaven beach(see picture), white sands and turquoise waters. We spent an hour on shore, and then went back on board for a lovely BBQ lunch. It was an all inclusive trip so the wine and beer was flowing well! We stopped a little later to do some snorkelling but the water wasn´t very clear and we didn´t see much. The next day we spent time around the pool and in the jacuzzi relaxing and Wayne had a game of beach cricket. In the evening we had a fancy dress parade and Wayne rose to the challenge as Rudolph the terrorist housewife- strangely he won the parade! We also played some very silly games, one where Nicole had to completely wrap me in toilet paper like a mummy- we failed miserably!